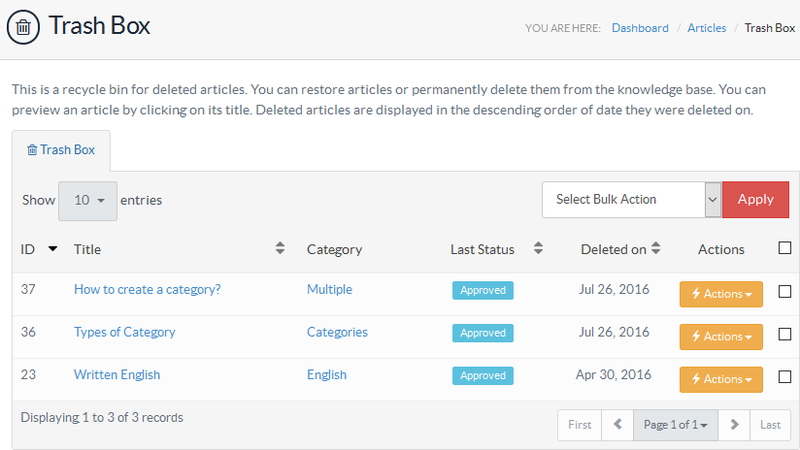 Trash box acts as a recycle bin for deleted articles from where you can either restore the articles or permanently delete them. Only superuser has the right to manage the trash box. 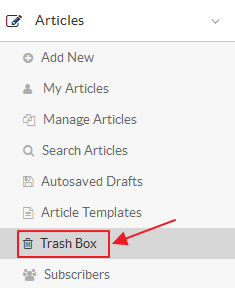 Click "Trash Box" link in the Articles section of left navigation bar to open ’Trash Box’ page. ID: This column displays the auto generated serial number of the article in the knowledge base. Title: This column shows the title or name of the deleted article. You can click on it to preview the article. Category: This column displays the categories associated with the article. Last Status: This column depicts the status of the article when it was deleted. Deleted On: This column displays the date when the article was removed from the ’Articles’ section. Purge - Click to permanently remove the article from the knowledge base. Restore - Click to restore the article back to its original status. You can perform the same action on more than one article using "Select Bulk Action". For this, you need to mark the check boxes corresponding to articles on which operation is required, then select an action from a bulk action drop-down list and click on "Apply" button.